"I think I was very concerned with understanding the body ... not specifically as far as muscles went, but the way inner structures - the rib cage and pelvis - two major inner structures - work together. Because I was so interested in the way it articulated I didn't deal with the arms or legs or head. I was not thinking of realism at all, but the basic articulation: coping with a complex three dimensional form ... I was never concerned to get a 'type' of figure ... I'm really only interested in the form". 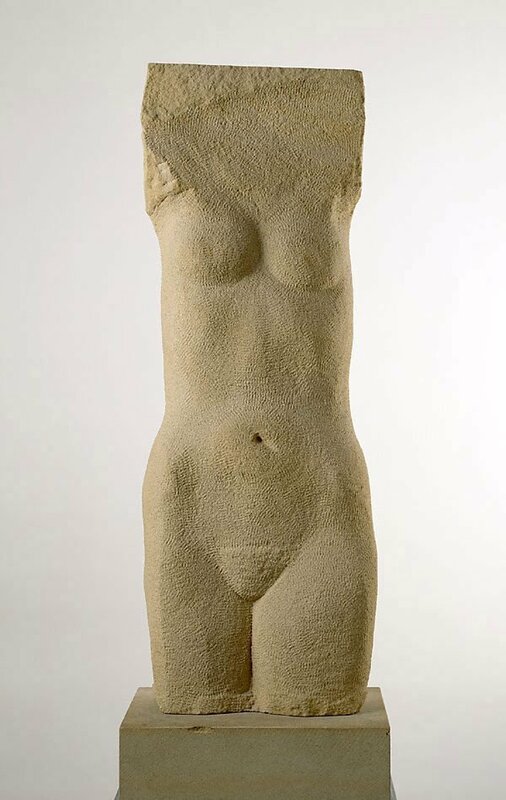 Speaking in 1994 of an earlier sculpture she had made, Madigan expressed what have continued to be her main concerns in her focus on the female torso, since carving her first stone female form in London in 1952. Rosemary Madigan was born in Glenelg, South Australia in 1926 the daughter of geologist and explorer, Cecil Madigan. Having very early decided to pursue a career as a sculptor, she studied at the Girls Central Art School in Adelaide at the age of thirteen and later at the South Australian School of Art. She attended night classes at East Sydney Technical College in 1940 and again under Lyndon Dadswell in 1948, graduating with a Diploma in Sculpture. In 1950, award of the New South Wales Travelling Art Scholarship enabled her to study at John Cass College in London 1952-53, and to travel in Europe and India. Upon her return to Australia in 1953, Madigan settled first in Adelaide and then in 1973, in Sydney, where she continued teaching and sculpting. Initially she experimented with assemblages (works constructed from small wooden machine parts, inspired by her friend, Robert Klippel), but returned to her wood and stone carvings of the human form, the area in which her most significant sculptures have been produced. Madigan is one of Australia's most distinguished sculptors who, having worked somewhat outside the mainstream of Australian sculpture, has made her reputation quite late in life. Madigan received the Wynne Prize for 'Torso' in 1986, relatively late in her artistic career. She had entered the Prize three times before without success, and this was also the first time a sculptor had won the prize in thirty-three years.